Police early Sunday morning swooped down at two locations – Agricola, East Bank Demerara and North Road, Bourda- arresting 29 suspects and seizing several items suspected to have been stolen, the Guyana Police Force said. The operation code-named “Operation Restore Order” was conducted between 4:45 and 8:00 AM and netted 29 suspects, including one woman, for various offences. They include possession of a firearm component, cocaine and marijuana possession and robbery under arms. 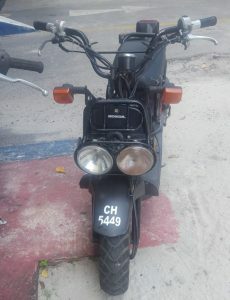 Under the command of a Senior Superintendent, the operation that was conducted by 220 ranks also seized two motorcycles, a number of cellular phones and other items suspected to have been stolen or unlawfully obtained. The motorbikes bear licence numbers CG 1157 and CH 5549. This is believed to be the first major anti-crime crackdown since Police Commissioner, Leslie James; Deputy Commissioner (Crime Chief), Lyndon Alves; Deputy Commissioner (Operations), Maxine Graham; Deputy Commissioner (Intelligence), Nigel Hoppie and Deputy Commissioner (Administration), Paul Williams took office in early September.